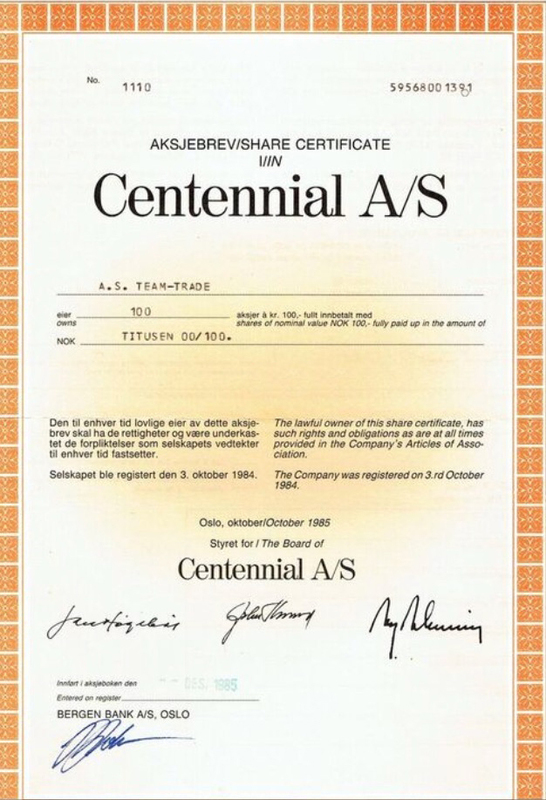 Centennial AS was incorporated in 1984 and was restructured in 1996 with Mr. Endre Rösjö as a majority owner. Mr. Endre Rösjö acquired 100 % of Centennial AS through his holding company, Centennial Holding SAH registered in Luxemburg in 2002. Centennial has since been an investment company with emphasis on the acquisition of significant ownership stakes in a variety of potentially rewarding projects in different industries. Our objective is to invest with a low risk profile but to achieve high returns through active ownership. Centennial does not own quoted stocks on a speculative basis. In December 2007, Centennial stated the time for new acquisitions – be it new ventures or property- had come to a temporary end. Rather than buying anything new, we have tried to conserve cash while developing our existing investments, such as Frydenberg real estate project. A few months later, Centennial AS reorganised its properties in a newly established subgroup, Centennial Eiendom ASA. Centennial had partnered with a major industrial concernto complete a 650 unit housing development. The deal was settled by cash, however after the real estate crash in 2008, Centennial re-negotiated the deal to be partially settled by apartments. Centennial took delivery of a new residential building comprising 25 quality apartments at a low market price. Because of the weak real estate market, it was decided not to sell the building. Since delivery, all apartments have been rented out at satisfactory rental levels and the building was sold early 2016, in a all time high market. Our other commercial properties, such as Ryensvingen 3 and Økernveien 119 & 121, has been experiencing increasing rental income the recent years. Centennial AS is a group company intended for new acquisitions. A standby commitment of NOK 100 million in new equity was obtained to invest in projects and industries with high growth potential. AS a result, Centennial has invested in the M2M-provider Com 4 and the UAV & Drone manufacturer Robot Aviation. In addition, Our investment in “SeniorStøtten” continues to bring a smile into the life of an increasing number of senior citizens. Outside the Norwegian market, Centennial as has invested in the wholly owned subsidiary, “Pinemont Securities Ltd” ended 2008 with historically its second best result, despite the financial crisis. In January 2008, Pinemont stated on its internet home page www.pinemont.com that for the coming 12 month period, AAA bonds should be preferred to speculative ownership of shares. Some of Pinemont’s clients are quite pleased with this advice. Centennial originally owned 10% of Vyke Communications Plc, but this company and Vyke Wholesale Ltd and Vyke Communications (UK) Ltd went into administration in April 2011. Centennial AS, through Vyke Telecoms signed an agreement to acquire the assets and business agreements of all 'Vyke' companies. The development of Vyke, through Vyke Telecoms Ltd is now a priority for Centennial AS. Centennial hopes for a 'turnaround' and exit within four years. Vyke strives to be best in class for VoIP, for all operating systems for smartphones. Centennial has invested in real estate in both Europe and United States. In early 2013, Centennial saw great oppurtunities in the real estate market. With the subprime mortgage crisis, the U.S. entered a deep recession. U.S. housing prices fell nearly 30% on average and the U.S. stock market fell approximately 50% by early 2009. As of early 2013, the U.S. stock market had recovered to its pre-crisis peak but housing prices remained near their low point. In February 2013, Centennial AS established the subsidiary Centennial Arizona LLC, and purchased 40 acres of land near Sky Harbour Airport and four large lots in the Black Mountains. In addition, through an agreement with The Ahlvin Real Estate Group, Centennial ramped up its investments by establishing a loan portfolio of more than 10 houses and commercial buildings. In 2016, USD has increased in value against NOK, providing an unrealized currency gain of nearly 50% on the first investments. The loan portfolio with Ahlvin Real estate is growing. In late 2014 and early 2015, Centennial began to invest in smaller real estate projects, such as Woodstock in England and in Monaco. The group already owns larger properties in France through its subsidiaries.